Don't these look fun? We actually served them with a salad to round out the meal and it was delicious! Baked potatoes are so versatile and this recipe is no exception. You could definitely change it to a sweet potato if you want too or take off or add something, of course. This is also a great recipe to make for kids to get them to eat more vegetables. I'm sure there are endless combinations of ingredients that could top these, and they're great for splitting with people. Maybe some steamed broccoli and a sprinkle of cheese? maybe just black beans and salsa? meatless chili? pesto and tomatoes? fat-free sour cream mixed with horseradish? so. many. choices. You can already control the portion sizes and all of the ingredients so maybe think about using fat free plain yogurt instead of sour cream? making your own salsa could be fun too. I almost always make my own salsa to eat but every once in a while we do purchase a jar of salsa to cook with or just to eat with tortilla chips. We actually don't eat to many potatoes for some reason in our house. Maybe we should work on that. We used to say my sons heart belongs to sweet potatoes because he loved them so much (he still does though). 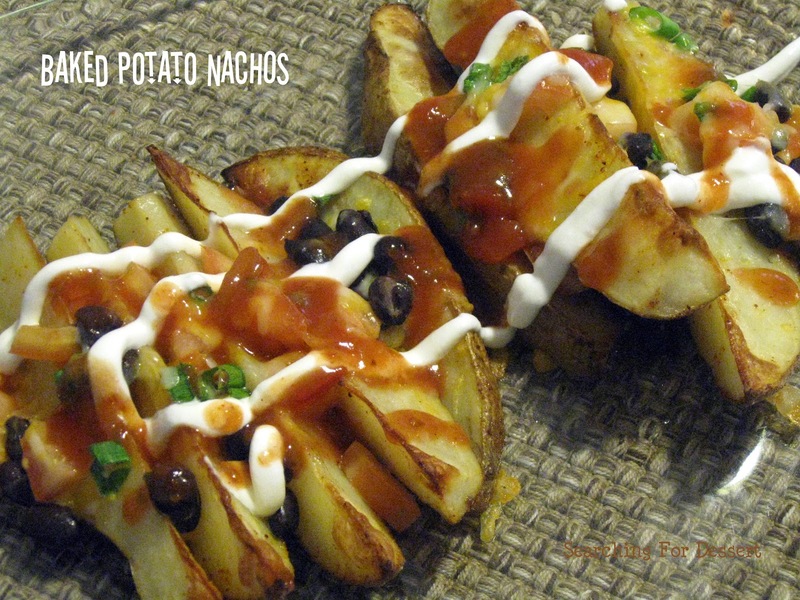 Hopefully this recipe will be inspiring for more potato involved dinners :). 1. Preheat oven to 425 degrees. 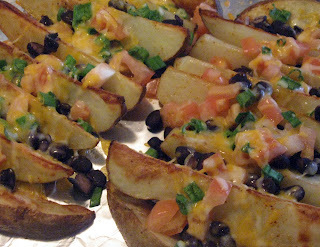 Scrub potatoes and cut into 1/2-inch thick wedges. 2. Place potatoes into a medium size bowl with the oil, garlic salt, cumin, chili powder, and cayenne pepper. Stir well to coat potatoes with oil and seasonings. 3. Transfer to a large baking sheet and spread into a single layer. Bake for 25 to 30 minutes, stirring several times, until crisp and golden brown. 4. Top with cheese, beans, tomatoes, olives (optional), onions and chiles. Bake for 5 minutes more to melt cheese. optional, serve with salsa, guacamole and sour cream.